It’s been a while since I’ve done a tag… and believe you me, I have about 10 of those suckers in my drafts… they’re fun and I thank everyone who’s been tagging me. I shall get around to some of them in the future, I may not… This tag, however, was created by the wonderful Drew @ The Tattooed Book Geek and so this tag shall be done! Credit Drew @ The Tattooed Book Geek as the creator of the tag, either use the created tag name graphic or create your own and link back to my blog. I created my own graphic. It’s not pretty but practice makes perfect so I shall keep practicing… also, anything to procrastinate from what really needs to be done, right? Even though I so wanted to come up with a totally original answer for this one, there’s no denying the power of a good fantasy book. Fantasy it is… And I like it with a decent villain, corruption, heart-stopping action and kickass hero(ine). I also like it when it comes in the form of trippy and otherworldly! Who’s your favorite author from the genre? My life pretty much has 2 differing reading timelines. One when I was younger and didn’t know about boys and booze so from back then I would say Tove Jansson would have been my favourite with her Moomin tales. Tove wrote some fantastic children’s tales (and other books) full of so much wisdom and morality. Plus the Moomin themselves are just adorable looking. The other timeline starts some 10 years ago when I moved to Ireland and got back on the fast-moving reading train. Favourite author from the most recent and current timeline in the fantasy genre would probably be Mark Lawrence. Make no mistake though, there are some brilliant indie authors out there whose fantasy books are just as mind-blowingly fantastic (pun!) and by no means should be discredited for the sake of ‘bigger’ names. Not to mention all the well-known fantasy authors whose books I haven’t even managed to read yet.. but I want to. So badly, I do! The endless possibilities. I am always worried about starting to see a pattern in fantasy books, and sure, there is some but then again some of the detail is quite unique to everything I’ve personally read so I am always in awe at how many brilliant brains there are behind the books at producing scenes, settings and characters. It’s the fantasy author’s imagination that knows no bounds, their ability to tie the fantasy element into so many different aspects that can be found in other genres that really tells me- read fantasy and you have it all! The books that definitely re-ignited my flame for reading was The Broken Empire trilogy by Mark Lawrence. I think, mainly, because I was in a weird place in my life at that time… you could say, stagnant, and these three books just shot me up with so much excitement. I realized- “Hey! You don’t need to live a boring, routine life… read more, you daft girl! Read more!”… and off I went…this very blog was turned from a ‘whatever the hell this was before’ into a book blog because I wanted to share my excitement around the trilogy and suddenly I started getting review requests and the rest is history. If you had to recommend at least one book from your favourite genre to a non-reader/someone looking to start reading that genre, what book would you choose and why? I would recommend The Steps of Power; The Kings book series by J.J. Sherwood, starting with “Kings or Pawns”, followed by “Heroes or Thieves”. I really enjoyed “Kings or Pawns” with it’s wide character cast in the swirl of elven political intrigue. I would also recommend a recent discovery of mine- The Saga of Thistles and Roses by Karen Gray. A fantasy with a twist of post apocalyptic/futuristic element in a Scottish setting. I mean, you have unicorns and other magical beasts with some serious hard-to-see-coming twists and fabulous characters in royal intrigue. I read because I have FA else to do with my free time at the moment. Reading has always been my preferred medium. I rather read than watch. Give me a piece of content on paper or on video and I will always choose paper format. Next Next post: Book Promo Mail + Navitrolla 2017 Calendar + 500! Ah, my poetry does pull on the heartstrings at times! Great answers, fantasy = awesome! 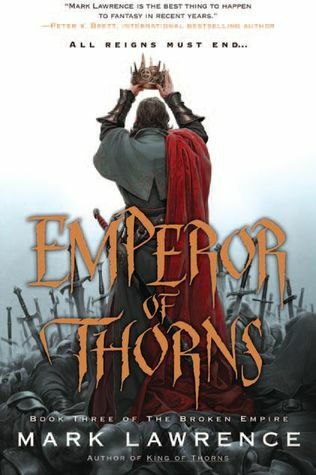 High praise for Mark Lawrence, he’s such a great author and The Broken Empire trilogy is awesome, after GoT got me into reading again and fantasy Lawrence along with Brett and Abercrombie were the authors that cemented my love of fantasy. Endless possibilities is so true! i have a tat as well so i felt i needed to make a point about tattooed people not being scary and unapproachable! yeah, Abercrombie is one of the authors I need to check out asap! Abercrombie is great, especially if you like sarcasm in grimdark. Currently reading Mark Lawrence at the moment and loving every minute of it! 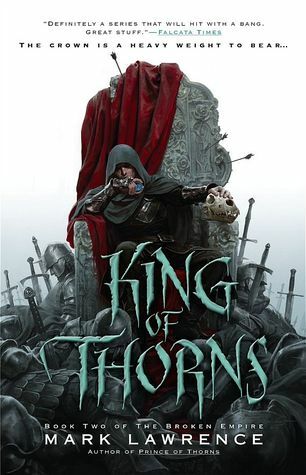 I’m about 80% of the way through King of Thorns at the moment, easily one of my favourite series already. Thanks for sharing the other recommendations, will take a look at them! that’s awesome! i’m glad you’re loving King of Thorns!!! 😊 i think you might like Sherwood’s books as well! Thanks, Liz. Consider it added to my (ever-growing list). Totally agree about the endless possibilities!!! Leave it to Drew to make his rules for this tag about a mile long, listing the reasons to use or not his graphic and about how practice makes perfect. Lol 😂And you even had to use his name at the top of your post in the graphic. Double LOL I am one of those people who doesn’t have a favorite genre. I read so many that I told Drew not to tag me because I knew I’d never be able to choose just one. I pick all of them. 🙂 I knew you’d say fantasy though just from some of the books you’ve reviewed. But you read a really good mix of genres, so I think you’re like me that way. I’m all over the place. I went from science fiction to fantasy to romance to contemporary all in one week. I love little Jorgy. I’m glad the books are on here. Mark Lawrence changed my thoughts on adult fantasy completely. I still need to finish that series. woop and double win for Lawrence… glad that series is going down a treat for you… and for me, scifi is something i feel i should experiment more with… hmm…any good recs? but of course I’m going to put your name in the graphic- you’re the Creator of the Tag, the Lord of the Questions and The Original! So why not?! 🙂 Credit where Credit’s due! oh well… maybe I did do it wrong…? I don’t know… I’m an amateur at this 😀 especially graphics! Aww, thanks 🙂 yes… I’m just soooo bad at picking the image and moving and shaking the text and finding the lovely fonts… your recent graphics are just sooooo pretty! Thanks. 🙂 I’ve found a style I like and think it looks cool, people will probably get bored with it though! Bored or not, you also gotta think of your blog’s branding a bit.. so sticking to something you truly like is essential 🙂 besides, i can#t see how someone could get bored with the font for example you use… it’s used on many book covers as well and it really works. It sure is an awesome name for a font… cool! yeah, no! 😀 I would only torture people with poorly chosen images… pfffft! What on earth are you guys talking about? Bleeding cowboys. Hmm… 🤔 Sorry I’m days late to respond. I’m so unorganized lately. My brain is mush. 😂 Ha! I was just giving Drew a hard time. We have a love, love, harass relationship. He secretly loves it. I have read a few responses to this tag and must say I admire the way everyone tackles it. I would be very hard pushed indeed to come up with decisive answers to the questions. Oh my my TBR pile just grew a ton!! What great answers!! Ahahaha @ he’s funny and friendly, despite the tattoos :’). Cool, thumns up for Steps of Power… i hope you’ll like that one too… it was quite interesting and I should soon be able to start reading the second one in the series. Meg from Magic of Books also loved these! I’m surrounded by fantasy lovers! 🙂 It’s true that the genre offers endless possibilities despite the usual tropes being used. I like how it’s the best genre to escape reality because who’s gonna come across a shapeshifter in real life, haha! That’s a relief 😀 ❤ What if we already live in a world of magic??? Fantasy is the popular genre. I started to wonder if it’s cause most book bloggers read fantasy or if it’s just the majority of people who do this tag. Mark Lawrence is one of the many fantasy authors I need to check out. Yes, Mark Lawrence writes a helluva book. I hope you do enjoy when you get a chance to read. Are you thinking to start with The Broken Empire trilogy or with his most recent series? Yea, I prefer to start with Broken Empire. I’ve heard so much about it. I will def do this tag…though my answer is gonna be the same!! I love how you tag me “Teach!” You kill me, Boss. I heart you. Fantasy!! Yes, my favorite too. 🙂 I’ve never read Mark Lawrence but I’ve seen the books and have been tempted. And I agree- the possibilities, the imagination are the best part of fantasy. Love that graphic with the eagle, BTW. Christian fantasy is my favorite genre, specifically children’s books. C.S. Lewis is my favorite. I’m really into heroes and villains. Some Christians seem to think Christian fantasy is dangerous, but if you look at all the word pictures in the Bible, it’s really just another way to explain deeper truths. Fantasy and fiction beat boring explanations any day.